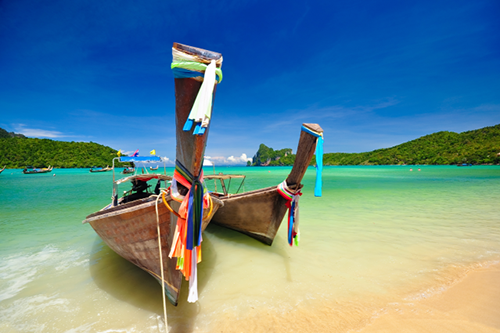 If you’re looking for an exotic getaway to the tropics, Phuket, Thailand is the perfect spot. An island located only a hop, skip and a jump from the southern tip of Thailand, Phuket lays claim to being one of the Thailand’s most popular tourist destinations. The island’s capital, appropriately named Phuket City, is the largest city in southern Thailand and has as much to offer visitors as the beach and mountain towns scattered throughout the province. The island is full of beautiful beaches and has some of the best snorkelling and diving in the world. Just off the coast of Phuket, there are a variety of smaller islands you can visit for a magical experience. Apart from its natural beauty, Phuket has a fascinating culture which you can learn about through the region’s many temples and festivals. The food is incredible, the locals are welcoming, and prices are affordable for Australian travellers. When you plan your trip to Phuket with Webjet, you can save money by bundling together your flights and hotel costs. Webjet offers package holidays to Phuket that can help you save hundreds of dollars on your Thai adventure. Webjet offers flights from airports all across Australia, as well as hotels to suit every budget. Book your Phuket holiday package today and start planning for your experience in the incredible city of Phuket, Thailand. Whichever Australian city you’re travelling from, there are lots of flights available to you when you book a Phuket holiday package with Webjet. Qantas, Virgin Australia, Thai Airways, Jetstar, AirAsia, Malaysia Airlines, and Singapore Airlines all offer flights to Phuket from airports all over Australia. Travelling from Sydney or Melbourne? A direct flight will having you touching down in Phuket in less than 9 hours. If you’re departing from another city in Australia, you can still get to Phuket quickly and easily with just one stopover. The most common stopover cities for flights to Phuket include Sydney, Melbourne, Bangkok and Kuala Lumpur. Where can you stay with your Phuket Holiday Package? The Surf Hotel is located in Patong, which is one of the most popular neighbourhoods in Phuket. The hotel is just across the road from the beach and offers some beautiful views of the ocean. It’s also just a 10-minute walk from the centre of Patong, where you’ll find lots of restaurants and bars. The hotel has a trendy feel to it and offers rooms to fit every price range. Amenities at the hotel include a restaurant, spa, gym, golf course, water activities, and a rooftop pool. Sunset Plaza is a cluster of serviced apartments, located near the Big Buddha in the Karon area.. It’s within walking distance to Karon Beach, the Karon Temple Market, and lots of great restaurants. Many of the guest rooms have an ocean view. Amenities within the Sunset Plaza include a swimming pool, a gym, and a sun terrace. If you’re looking for a luxury feel with budget prices, Cocoville is the perfect resort for you. The hotel has a stylish and modern Thai design and rooms ranging from standard hotel rooms to luxury villas. While the resort is not within walking distance of the beach, it has a beautiful pool to make up for it, as well as scooter and car rentals to help you get around. Other amenities include a swim-up bar, spa, airport transfer, yoga, and a concierge who can help you plan excursions around Phuket. This resort is located in the northern part of Phuket, away from the nightlife and backpacking crowds. It’s the perfect spot to be if you’re looking for a quiet, relaxing experience in Phuket. The resort is located right on the beach and is made up of 47 beautifully designed rooms and villas. The design of the resort is a sophisticated take on traditional Thai style. The resort is an easy walk to the beach and has lots of amenities to keep you comfortable during your stay, including a pool, restaurant, poolside bar, fitness centre, spa, and free airport transfers. Thailand is known for its beautiful temples, and one of the best ones to visit in Phuket is Wat Chalong. Inside this Buddhist temple, you can see several artefacts, including a walking stick that is said to hold healing powers, and even a piece of Buddha’s bone. Wall art throughout the temple teaches you about Buddha’s life story, making Wat Chalong a great place to learn about the spiritual side to Phuket. The temple is beautifully designed and a must-visit when you book airfares to Phuket. Northwest of Phuket is Phang Nga Bay, which makes for a perfect day trip. Several boat tours are available from Phuket to Phang Nga Bay, or you can hire a private boat for your group. The bay is full of limestone cliffs jutting out from the water, and the bay is also home to the famous James Bond Island. On the northern end of Phang Nga Bay, you can visit a fishing village called Koh Panyi. The floating village is made up of stilt houses that are popular throughout Thailand. With more than 30 beaches, Phuket is an ocean-lover’s dream and you will definitely find one that takes your fancy. Patong Beach is one of the most popular. It’s close to the centre of Phuket Town and is a popular nightlife area. For a quieter beach experience, Karon Beach, Kata Beach, and Paradise Beach are great spots to go. These options have quiet and secluded atmospheres, but are still close to lots of restaurants. All of the Phuket beaches are beautiful with white sand, bright turquoise water, and lots of palm trees. Recognised as one of the most prominent symbols of Phuket, this statue is 45 metres tall and sits on a hill overlooking the city. From the Big Buddha, you can get a great view of some of Phuket’s top beaches, including Karon, Kata Noi, and Phang Nga Bay. The Buddha is made of Burmese marble and shines beautifully in the sun. The area around the Big Buddha gets extremely hot in the middle of the day and afternoon, so for the best experience, make it your first stop of the day. Phuket is located on an island itself and it is surrounded by other, smaller islands that make for great day trips. With the close proximity of many of the islands to Phuket Town, you could easily visit for a day, or you could plan to spend a few days on the surrounding islands. All of the islands have beautiful beaches and great snorkelling and diving. The Phi Phi Islands are some of the most popular to visit outside of Phuket. They are just 45 minutes from Phuket by speedboat and 90 minutes by ferry. There are several Phi Phi Islands, with some known for their nightlife and others known as a quiet paradise. The Similan Islands are another beautiful spot, located 45 minutes from Phuket by speedboat. For a day of diving and snorkelling just off the coast of Phuket, the Koh Khai Islands are only located 20 minutes from town by speedboat. There are several night markets throughout Phuket, and this is one of the best. The market is held on Tuesdays and Fridays and is set up right on the temple grounds. The market is full of local crafts, art, and clothing that will give you a great insight into Phuket culture. The market also has lots of food stalls where you can sample some amazing Thai cuisine. Some of the must-try foods on a visit to Thailand include pad thai, tom yum, panang and green curries, and mango sticky rice for dessert. Phuket is located in the tropics and temperatures are relatively stable throughout the year. It gets hot during the day, and the evening mercury cools down but stays at a comfortable 24 to 25 degrees Celsius. Although the temperature doesn’t change much, Phuket experiences vastly different seasons throughout the year. Thailand experiences a wet season and a dry season. The dry season lasts from November to April and is the best time to book a package holiday to Phuket. January and February are the busiest months, so be sure to book your Phuket holiday package in advance to get the best deals. Monsoon season lasts from May to October. These months experience a lot of rain, and some attractions can even close for the duration of this wet season. Please note that ocean conditions can be dangerous during monsoon season, and swimming and diving are not recommended due to powerful waves and rip currents. Airfares and hotel rates drop during the wet season, so travelling during this period could be a good option for travellers who aren’t planning to dive or snorkel in Phuket. Phuket has two major celebrations throughout the year. Each offers an exciting look into local culture. The Songkran Water Festival is held in April to celebrate the Thai New Year and includes lots of water fights. Water is seen as purifying in Thailand, so it’s a way to purify yourself of bad memories from the previous year and start the new year with a clean slate. For a more relaxed festival, you can book a package holiday to Phuket for the Loy Krathong Festival in November. During Loy Krathong, hundreds of floating lanterns are released into the sky, making for some beautiful sights.